Sometimes it is difficult to find time to craft or sew. I love sewing! There are so many ideas and techniques I want to try. I don’t want my skills to deteriorate. I decided to force my brilliance out. I mean, make me make stuff. One of the many things I do is run contests for my sister-in-law, Colleen Houck. She is an author. Her fourth book comes out in September and is called Tiger’s Destiny. If you haven’t read these books yet, start with Tiger’s Curse, the first book in the series. There is an audio version for those of you who like to listen to books. This year we made the switch where I also started handling all the prizes for these contests. It has been a rocky start but is almost going smoothly. Some prizes are themed prize packs and I get to choose what goes in. January had a dragon theme and I was struggling with finding items within my budget. 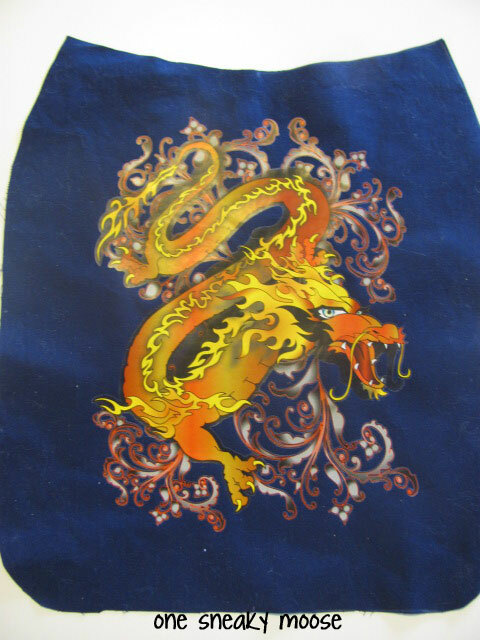 I found this iron on dragon but didn’t like the bags (or the price). So I made a bag. It was pretty easy (I’ve never made a bag before) and I think I did a pretty good job. I enjoyed myself so much that I decided that each prize pack would get something made by me! See? Two birds with one stone. I get to craft and people get a prize. 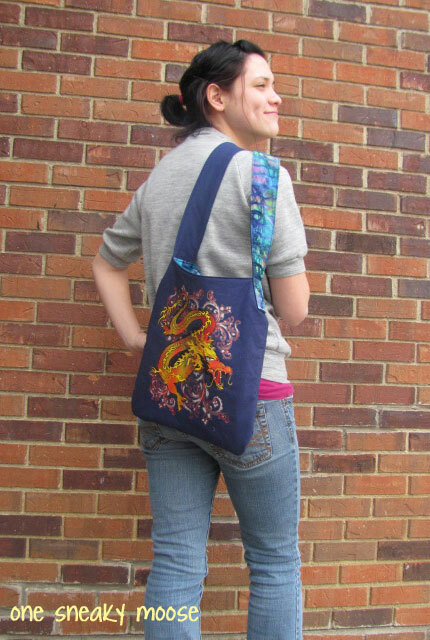 Let me show you the bag I just sent off to the winner for the dragon contest in January. I mostly followed a tutorial because I’ve never made a bag before. Unfortunately, I can’t find it again. I was sure I had saved it! I can’t even find it on my Pinterest boards. I really wanted to give a shoutout to whoever it was. Because of that, I didn’t take pictures meant for a tutorial. I started off by making a pattern. I used a brown paper bag. 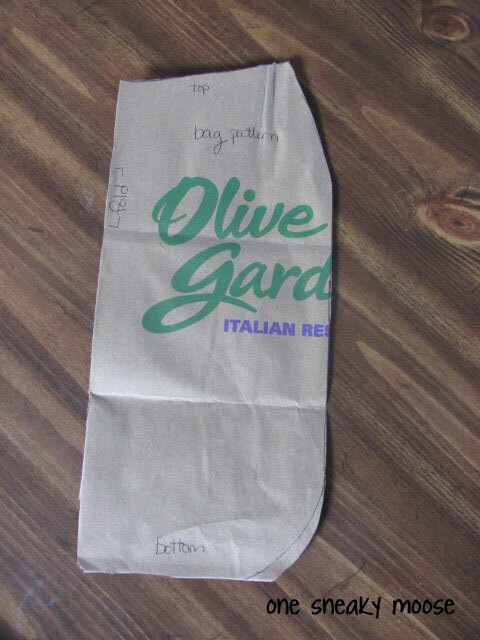 Olive Garden, anyone? Jared never knows why I keep crap certain things. This is why. Something free so I don’t have to worry about messing up a pattern. And sturdy. 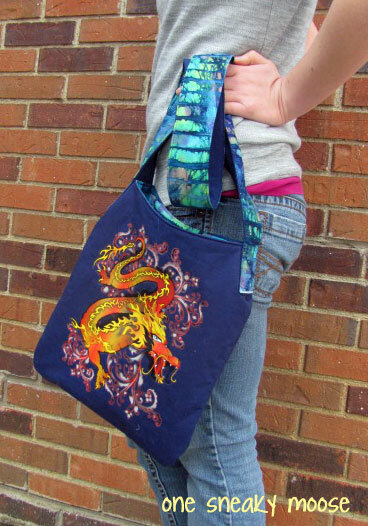 I tapered the top in but if I ever make a bag like this again, I would not do that. For a bag as long as this is, the tapered top made it a little awkward to get into. For a shorter bag, I don’t think it’d be a problem. 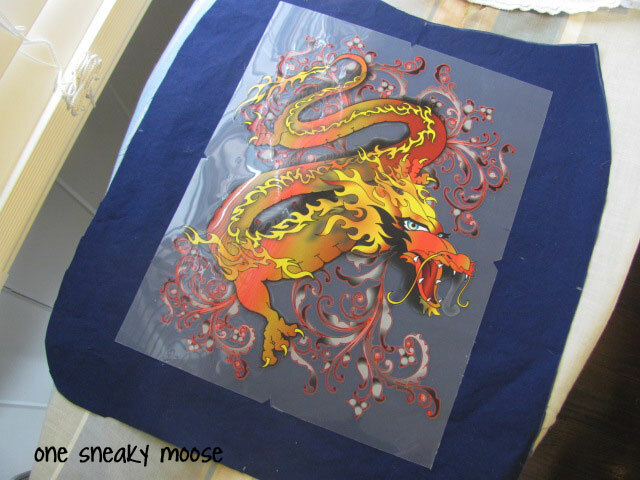 After cutting out all my material, I ironed the dragon onto the right side of the front piece of material. I read all the instructions. Twice. Maybe three times. And then when it didn’t seem to completely work the first try, I read them again. It turns out that I just needed to iron longer than the instructions said to. The other thing I had to make sure I did was that each and every edge (look at how many of them there are with all those curls!) was sealed. Otherwise, removing the backing wasn’t easy. Oh! And remember to go S-L-O-W-L-Y when you remove the backing. You don’t want to rip anything off. Luckily, I didn’t. Rip anything off, I mean. Fast forward and I finished all the sewing. This bag is lined with an inside pocket! And look! 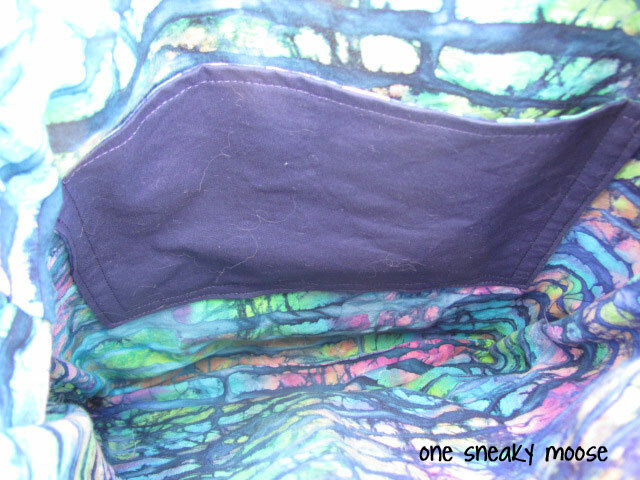 The pocket is lined too. 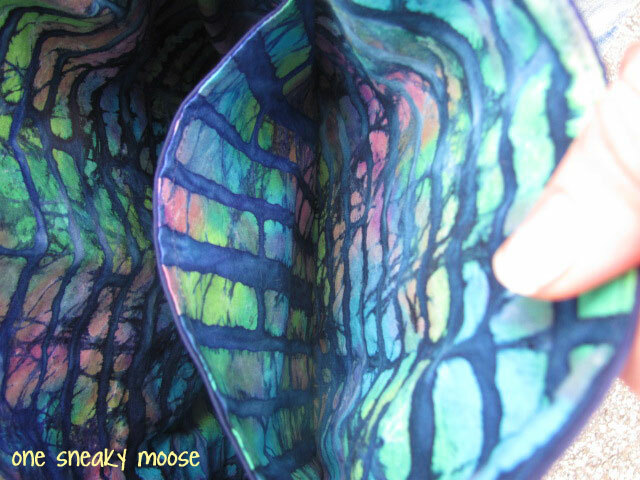 See how I even cut out the lining o the pocket to be different from the lining of the bag? Just wanted some variety in there. I love how this bag turned out! I wasn’t sure how it would go. I thought I would have to buy material because I didn’t think anything I had would go. Then I found this blue in my stash. And decided the patterned blue and green would be PERFECT. I called my sister to make sure I could use it. It has, after all, been sitting in my house for a few years. 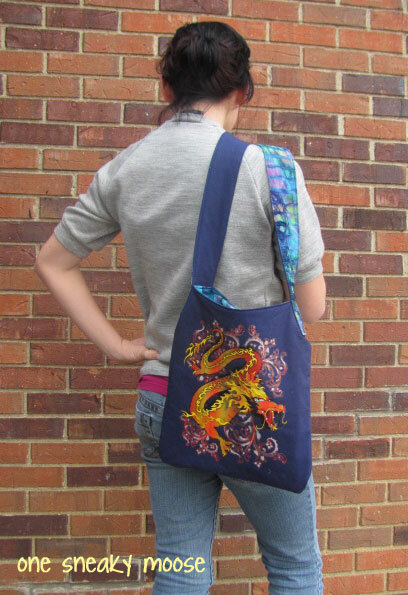 I love how I turned the bag strap over so the blue/green pattern is showing! Not only is this bag lined, but it is actually three layers. Between the outside and the lining, I put a really thin batting (quilt batting, not polyfiberfillohemgeelittletuftsofwhiteareeverywhere batting). Rather than clean my house and take pictures on a nekkid dress form, I waited until family came over. Then I dragged my sister outside so I could take pictures. I told her I would be cropping her face off so it didn’t matter what face she made. This is me not showing her face.